The most critical enterprise risk for many companies is ensuring that the company maintains full access to the funds required for daily business needs, investment and dividends. Other enterprise risks can cripple a company, but a default can shut it down. Yet, this enterprise risk often is overlooked, misunderstood and minimized. Arguably, the best job in treasury is developing a funding strategy supporting the long-term plan, identifying the debt instruments, securing lenders, negotiating the terms, attending the closing party, and receiving the deal tombstones. Conversly, the worst job in treasury is the resulting debt compliance. Contained within those voluminous and dense debt agreements are scores of promises that must be kept to avoid default and the loss of financing. Managing those promises is onerous, mind numbing, and frustrating. There are no thanks for a job well done, only blame if there is a problem. Arguably, the worst job in treasury is debt compliance. Contained within those voluminous and dense debt agreements are scores of promises that must be kept to avoid default and the loss of financing. Managing those promises is onerous, mind numbing, and frustrating. There are no thanks for a job well done, only blame if there is a problem. While companies think nothing of paying millions of dollars in bank and legal fees to secure new funding, many devote little time or resources to actually managing their compliance. These companies erroneously believe that their covenant risk is limited to their financial covenants, relying on the kindness of their friendly bankers if they default on any of their other covenants. Having a debt compliance policy vs. only written debt compliance procedures vs. having neither a policy nor written procedures. Having a comprehensive checklist of their covenants vs. a list of only major covenants vs. no covenant list at all. Preparing a covenant exception report for the CFO’s review vs. no exception analysis. The report identifies which covenant exceptions need to be reported to the lenders and which are emerging issues that need to be watched and managed. Reporting on debt compliance to the board vs. no board reporting. Using or not using questionnaires and calendars of required deliverable due dates. 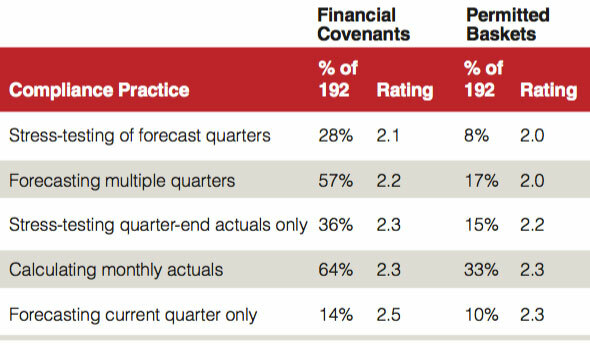 The clear best practice for managing financial covenants and permitted baskets is to forecast them four quarters out and stress test them against their limits. A comprehensive checklist is the most effective practice for managing non-financial affirmative, negative, and triggers covenants. Questionnaire and non-questionnaire input from other HQ departments and business units is needed because the compliance with the covenants is likely only known outside of treasury. 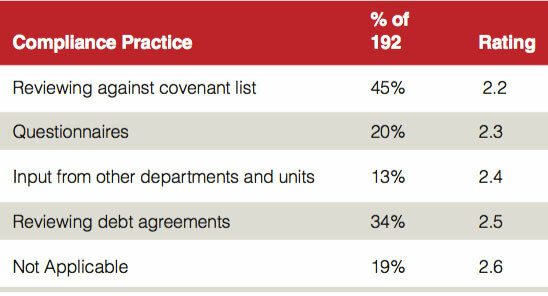 Incredibly, 20 percent of the group reported that managing non-financial covenants was “Not Applicable,” yet every company below AAA has them. It is a critical point: many companies do not know all of their covenants, yet they attest each quarter to their lenders that they are fully compliant with all of the terms and conditions of their credit agreements. These and other conclusions from the survey were used in developing the following outline of a best practices debt compliance policy.